Are you looking to install a new roof on your commercial property? Low slope commercial roofing systems will provide you with a few features that will make them worth a look. When you have one of these systems installed on your property, it’ll keep your roof strong for years to come and prevent you from running into any major problems. Take a look at the features most commonly associated with low slope commercial roofing systems below. Water is obviously something that you’re going to want to keep out of your roof assembly. With a low slope commercial roofing system, you can prevent water from becoming an issue thanks to the weatherproofing layer that’s included. It will stop water from working its way into your roof assembly. The strength of your commercial roof is also of the utmost importance. With the additional reinforcement that comes along with a low slope roofing system, it’ll stay strong for a long time. The reinforcement will add strength to it and provide you with puncture resistance and even a dimensional stability for the roof membrane. 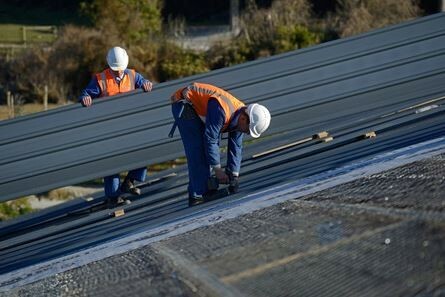 While the weatherproofing layer and additional reinforcement in a low slope commercial roofing system will play important roles, they won’t be able to do much without a solid surfacing on top of them. Surfacing will offer them the protection they need from the sun as well as other types of weather. Depending on the type of surfacing you choose, you can also enjoy benefits like solar reflectivity and fire resistance. In addition to picking out the right commercial roofing system for your property, you should also work with a qualified and experienced roof installer. Ray Roofing Supply is here to handle all your commercial roofing needs. Call us at 330-452-8109 today to inquire about our services.